Thong Nai Pan Noi is going to get its first 7-11 shop. It is due to open early in 2018. Don't get too excited - internecine capitalism is not something frequently found in Koh Phangan. It is not likely to start a price war and a deflationary price spiral for tourist goods. 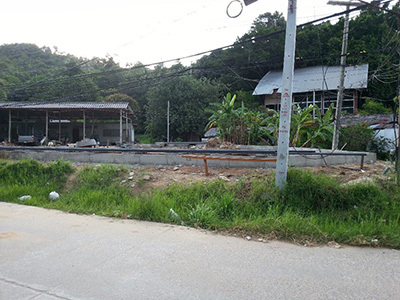 The new 7 Eleven is being built on the road at the back of the village that leads out to the main road. It is just past the bridge and opposite the big shop where you can buy vegetables, meat, large bottles of water and petrol. Thong Nai Pan Yai already has a 7 Eleven located on the main road at the southern end of the beach. When news of this shop first spread through the local populace there were many who were expecting cheap beer, coffee and snacks. That was in 2009. These people were soon disappointed. The shop opened with no fanfare with prices ranging between 10% and 20% higher than the other 7 Eleven shops on the island. The business model is clearly not to undercut the competition but to charge as much as the market will stand. Besides you don't step on toes that way. There are some items in the 7 Eleven in Yai and in Bantai and elsewhere on the island that are slightly different to those found in the local shops such as the coffee machine, the 7 Eleven sandwich (not for sandwich lovers) and the free hot water to make pot noodles. However, the large percentage of the wares found at the 7 Eleven in Yai are the same as those for sale in the local shops. What attracts tourists to 7 Elevens is the fact that everything is marked with a price. The staff don't moan about breaking notes and they invariably add up your bill correctly and give out the right change. You can get a bit weary of asking the price for everything in advance and having to work out if your change is enough. 7 Elevens are convenient in Thailand, and it is a certain type of convenience. Tourists expect cheap prices, but if they don't get them they still come back because they like the hassle-free nature of a 7 Eleven in Thailand. In Thong Nai Pan Noi the cheapest shop is Snoop Shop. It is opposite Jip Shop. It doesn't have sliding glass doors or neat displays. It is clearly a 'locals' shop. That is not to say that they don't welcome anyone into the shop. They have meat, vegetables, fruit and a range of everyday products. They have Thai snacks. They have beer and cheap water. You can find all kinds of useful things in the Snoop Shop especially if you can ask for it in Thai. I suspect that Snoop Shop will be cheaper than the Thong Nai Pan Noi 7 Eleven when it opens. The big shop opposite sells some items in bulk and is also likely to be better value than the 7 Eleven. These shops will retain much of the 'Thai' Baht spent in the village. It is the other numerous tourist shops that will be impacted by the new 7 Eleven. It is the 'tourist' Baht that is being gently fought over.